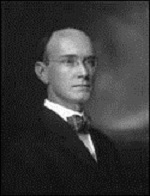 It was a pleasant spring evening in Austin, just after 7 p.m. on Tuesday, May 25, 1915, as Harry Benedict and Will Battle were sharing a jitney ride to a meeting downtown. Benedict was the dean of UT’s College of Arts and Sciences, while Battle had recently been named Acting President of the University after the departure of Sidney Mezes the year before. Their driver was a young man, about 18 years old, with a friend of the same age sitting in the front passenger seat. Heading west on 11th Street, in front of the Texas Capitol between Congress Avenue and Colorado Street, the driver suddenly accelerated, swerved abruptly to the opposite side of the road, almost collided with a car coming from the other direction, and took aim at a group of small dogs loitering near the curb. Benedict and Battle gasped as their driver, “greatly to his own delight and that of his companion,” managed to hit and kill one of the dogs. A century ago, the outbreak of World War I in the summer of 1914 triggered an economic recession in the United States, but out-of-work entrepreneurs discovered a business opportunity using Henry Ford’s Model T automobiles. Introduced in 1908 and regarded as the first car priced for the middle class, the Model T was famous for its mass production. 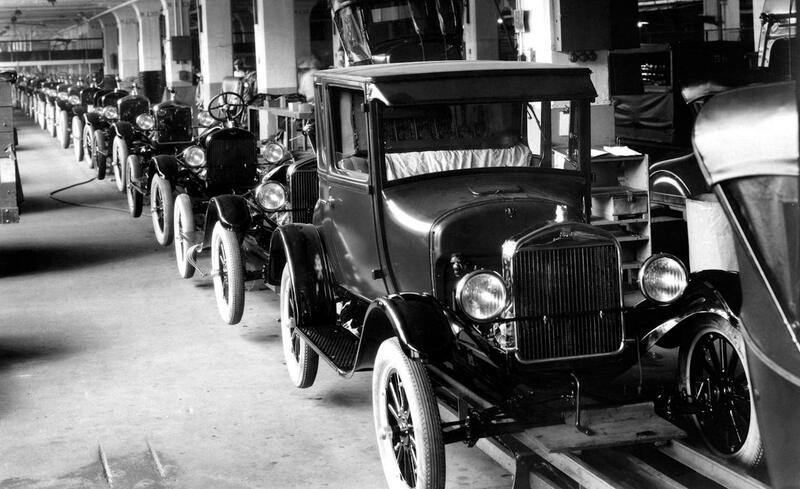 By 1914, Ford’s refinements to his impressive assembly line in Michigan had reduced construction time to 93 minutes, and a new car rolled out of the factory every three minutes. With the cost lowered to just under $400, thousands of Model T’s flooded the streets of America’s cities. But the growing popularity of the automobile began to challenge the trolley as the traditional form of urban transportation. Late in 1914, some enterprising Model T owners in Los Angeles discovered they could offer seats in their private cars for the same fare as a trolley: a nickel, or in the slang of the time, a “jitney.” Riding in the comfortable seat of a car was preferable to the crowded trolleys, and the cars – dubbed “jitneys” to distinguish them from the higher priced taxi cabs – could reach their designated stops faster. As The Nation reported, “This autumn automobiles, mostly of the Ford variety, have begun in competition with the street cars in [Los Angeles]. The newspapers call them ‘Jitney buses.’ ” By December 1914, the city had issued more than 1,500 chauffer licenses to jitney operators. Within a year, the idea was popular from coast to coast, more than 62,000 jitneys carried millions of passengers daily, and the Jitney Craze was born. “From hence to thence for five cents!” was the popular slogan. From 1915 to 1918, the jitney was the new, convenient, trendy way to get about town. In some ways it resembled an unregulated taxi service, as jitneys often survived by siphoning off streetcar passengers. Full-time Jitney drivers followed the routes of the trolleys, pulled over wherever a group of people were waiting, filled the car with customers, and took off for the riders’ destinations. For others, it was the first form of a ride-share or carpool. Some drivers who were commuting or otherwise going into town anyway would pick up a passenger or two and make a little pocket change on the side. The jitney fad inspired a series of popular songs, a new dance called the “Jitney Joy,” a Charlie Chaplin film titled “A Jitney Elopement,” and plenty of original fashions for women’s hats. Above: The Jitney Craze brought with it new popular music. Click on the title to listen to “Gasoline Gus and his Jitney Bus.” Also above: The Jitney Lunch café opened in St. Petersburg, Florida in 1915. All items on the menu were purchased a la carte for five cents each – the price of a jitney ride. Above: Locally, Joe Koen Jewelers promoted the “Jitney Plan” to purchase pocket watches, while Scarbrough’s Department Store advertised the “Jitney Knockabout” hat for women. A century later, Koen’s is still in business on Congress Avenue, while Scarbrough’s closed its last store only a few years ago. Harry Benedict and Will Battle were understandably upset with their jitney driver, both for his reckless driving and for killing a defenseless canine. “I indignantly reproached him,” recalled Battle (photo at left) in a letter written to Austin Mayor Alexander Wooldridge, “and told him I was going to report him and asked his name.” The young man refused to identify himself, though Battle managed to get the license number. Instead, the driver demanded that Benedict and Battle exit the car. Since the two had already paid their nickel fares, they refused, and the unhappy driver was forced to take his passengers on to their destination along Sixth Street. Two days after the incident, a description of what had happened, along with Battle’s written complaint, found its way into the Thursday morning edition of the Statesman. “[Battle] did not necessarily determine that he would boycott the jitneys,” the newspaper cautioned. “He wanted them reformed for his own comfort.” The timing, though, could not have been worse for local jitney drivers, as the City Council was just then considering its first ordinance on jitney regulations. Poor President Battle! Because of his note to the mayor, he was no longer a welcomed jitney passenger. Though Battle could still ride the trolleys, the newspaper stories let everyone know that Battle actually favored the jitneys. The offended trolley operators, then, had the name of the University president in their “book,” and gave him cold stares when he boarded. In a few years, the jitney all but disappeared from the urban landscape. While streetcars were taxed and provided income to their host cities, jitneys initially had no such obligations, and because they took passengers away from the trolleys, city budgets were ultimately affected. An abundance of regulations, some legitimate – standards for qualified jitney drivers, the safety of passengers, and so on – combined with some less fair – jitneys were not allowed to deviate from trolley routes, could only operate at certain times, etc. – made the jitney less profitable. By 1918, more than 90% of the jitney services that opened in 1915 had ceased operations. In the meantime, Dr. Battle continued to be a faithful rider of Austin trolleys and, later, the city bus system. Though he lived another 40 years after his jitney adventure, Battle never learned to drive a car. This entry was posted in Uncategorized and tagged Harry Benedict, Jim Nicar, jitney, William Battle by jimnicar. Bookmark the permalink.